I missed the first Hyden Park Supper Club, but Lazy Smurf’s recap and photos convinced me I needed to make it to the second come hell or high water. Or alluring VegFests in other cities. Thankfully, it hasn’t rained in a long time and the next big Texas Veg*n festival isn’t for a few months. 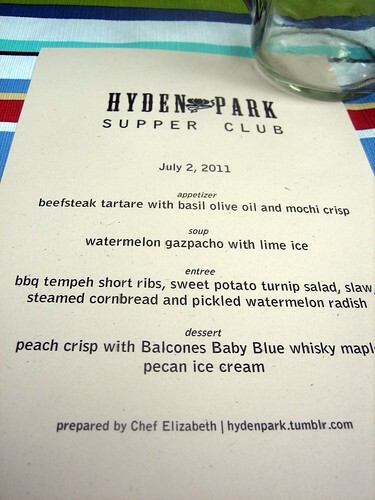 This is the second Hyden Park Supper Club, which Chef Elizabeth created to showcase real sustainable food. Or, leaves-to-roots cuisine, as she’s calling it. The meal was served in a Hyde Park yard decorated with twinkle lights, candles, and pleasant company. An array of jelly jar water glasses were placed carefully around the tables. But my eye was focused on the menu. The first course was this gorgeous tomato appetizer with a mochi crisp on the side. I’ve never seen such vibrant tomatoes. [Looking at the Hyden Park tumblr, it looks like they were dyed with beet juice!] I’ve never had mochi before, and I’m still not sure what I think of it. But I forgot about the first course the minute the second course arrived. I’m not really a fan of gazpacho (don’t tell my mother! ), so I wasn’t very excited for this course. 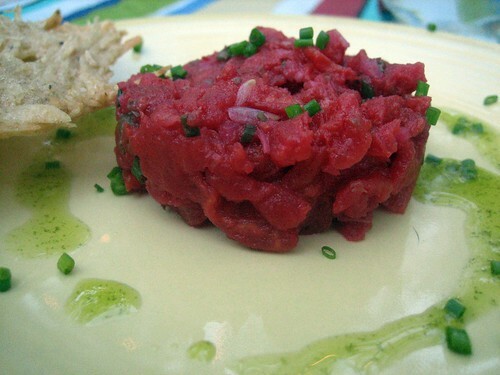 But this was nothing like tomato gazpacho. 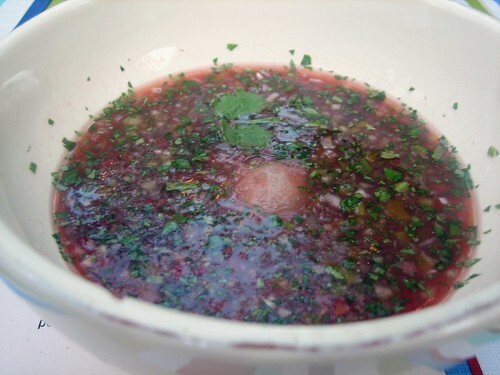 Cool watermelon–not too sweet–with little bites of red onion. The ice floating in the middle was lime juice, like a dollop of sorbet. I loved every sip of it. The main course floored me. I started to worry about having enough room for dessert. Starting at the top is barbecued tempeh ribs. There was none of the bitterness or crumbliness that tempeh can have, just a sweetness and a firm bite. Then a dill potato salad, which reminded me of the potato salad at Loving Hut in Arlington, which is a good thing. The turnips in the salad made it slightly sweet. Beside that, pickled watermelon radishes, which were surprisingly sour. And then the cole slaw. This was probably my favorite dish of the night. Cole slaw is usually a boring afterthought at a barbecue. But this one had some surprising ingredients besides the usual cabbage. Green apple and what I *think* was thinly sliced seedless cucumber. It was chewy and almost rubbery, in a good way. In the corn husk was steamed corn bread, which was the only thing I didn’t really care for. Which left me with just enough room for dessert. And I was really glad I had room left for dessert. The ramekins came out warm and the ice cream cold. The peaches in the crisp were just boozey enough from the whiskey. 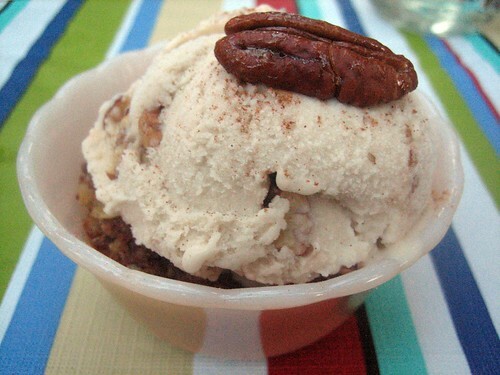 And the ice cream wasn’t coconutty or icy, but mild and creamy enough for the taste of pecans to come through. After the meal, other Texas VegFest organizers and I had a chance to talk with Texas State Veggie Fair organizers Jamey and Christy. Now I’m even more excited for both events. I tried to convince Jamey and Christy that the Veggie Fair needs an Earth Balance sculpture. Check out Christy’s description of the meal and the rest of her trip to Austin at her blog, The Blissful Chef. A big thank you to Chef Elizabeth for creating such a wonderful meal and dining experience. 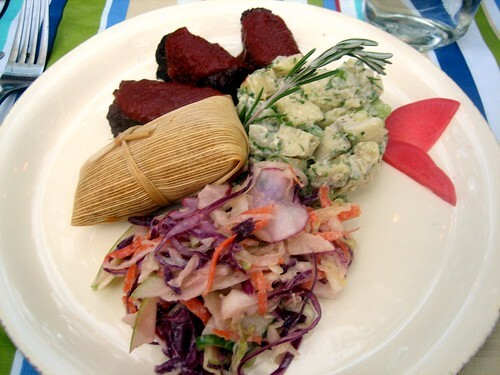 This entry was posted in austin, austin vegan restaurant, Lazy Smurf, restaurants, state fair, texas, texas cuisine, Texas VegFest, vegan, what vegans eat by mollyjade. Bookmark the permalink. Wow, everything looks fantastic but that dessert looks especially amazing. It was really good. There's something extra nice about a single serving dessert served in a warm ramekin.